Whether you're with you're with your friends, parents or kids, you're always feel welcomed and at home when you're looking to fulfill your sweet cravings at Oak & Ice. Ranging from chocolate, hazelnut, pistachio, to beetroot, mango, black coconut, matcha and more, there are many solutions to a relaxing Sunday afternoon. 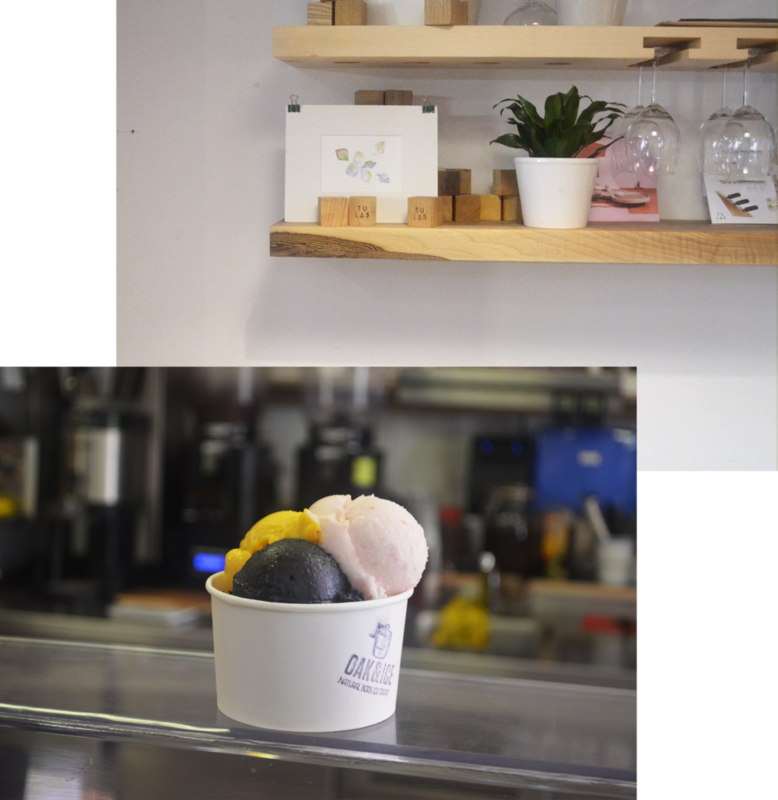 We had a fun ice cream break hanging out with Kinga and Stahu, the owners of Oak & Ice, chatting about ice cream and the making of the shop while sitting in the cute space downstairs where events are hosted in. Could you tell us about how you came to the idea of starting an ice cream shop? Kinga: We met back in Poland and we travelled from time to time all over Europe. Somehow we relate to Berlin very strongly every time we visited and finally we moved to Berlin in 2010. When we first moved, we were kind of surprised there weren’t many good ice cream shops. In the recent few years, the demand for good ice cream has grown much, since people started to become more conscious of how good the ice cream tastes as well as what it’s made of. We grew up in Poland having great ice cream, and thought we’d bring the kind of ice cream we used to have to Berlin. Our ice cream manufacture was started back in 1980s by a couple who are parents of our friend in Poland, where all the ice cream is handmade. They travelled to different places around the world, testing and picking raw ingredients for their recipes. We want to offer ice cream with quality and care to Berlin. Up until now, what’s the biggest challenge you’ve face since you’ve started this shop? 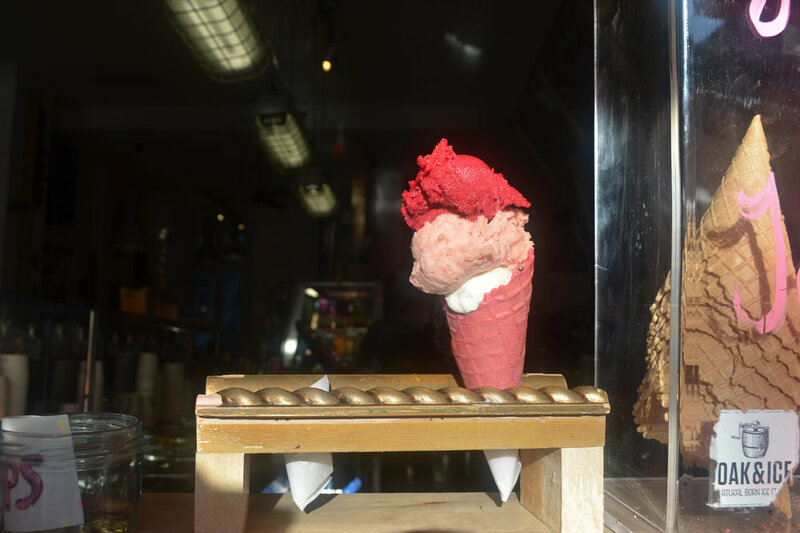 Stahu: One of the toughest challenge an ice cream shop faces is staying in business in the winter. When you have cravings, it’s very hard to get ice cream because most of the good shops are closed. In Poland, the cafes stay open and serve ice cream all year long, and since sales for ice cream likely goes down in the winter, some cafes will also sell gloves, watches, and so on. We also want to keep serving ice cream, no matter what season it is. Although in the winter the sales drop down quite a bit, people are more getting familiar with the idea of having ice cream. Even when it's cold outside, you can still come in the shop and enjoy warm pies, fudge brownies, and cake with a scoop of ice cream on the side. Aside from selling ice cream to consumers directly, are there any other ways the ice cream gets distributed? S: We have some interesting collaborations with chefs actually. They order our ice cream for developing their dishes. They usually take simple flavors like coconut, beet root, or vanilla, since it’s used to be paired with other food. There was an Israeli chef, who’s a friend of ours, and he came to the ice cream manufactory with us and transformed a traditional Jewish dessert into an ice cream dish for Jewish food week. We blended pure cream ice cream with silan, which is date honey syrup, and the result was great. People were surprised since they have never had this dish in the form of ice cream before. So far you’ve been running the shop for almost 2 years, how do you feel about this job you have opposed to if you were to do anything else? K: I like this job because it’s joyful, and free! Running your own business means you get to decide in which direction you want the shop to go, and there are so many opportunities and great ideas to explore. Although it’s a really demanding job which you need to think about all aspects of the business, at the end of the day when you received those positive comments from people who come to the shop, it’s totally worth it. Since ice cream is the type of dessert that are associated with happy moments, what are some of your favorite ways or settings of having ice cream? K: I skied a lot when I was a kid in the Alps, and during the breaks I would have some ice cream next to my cake with some hot chocolate, sitting indoors with the sun shining in through the windows. It was such a cozy moment. You’re already doing quite well, even though you’re still a relatively young business. What’s your vision for the future of Oak & Ice? K: We want to provide more and more ice cream for Berlin! 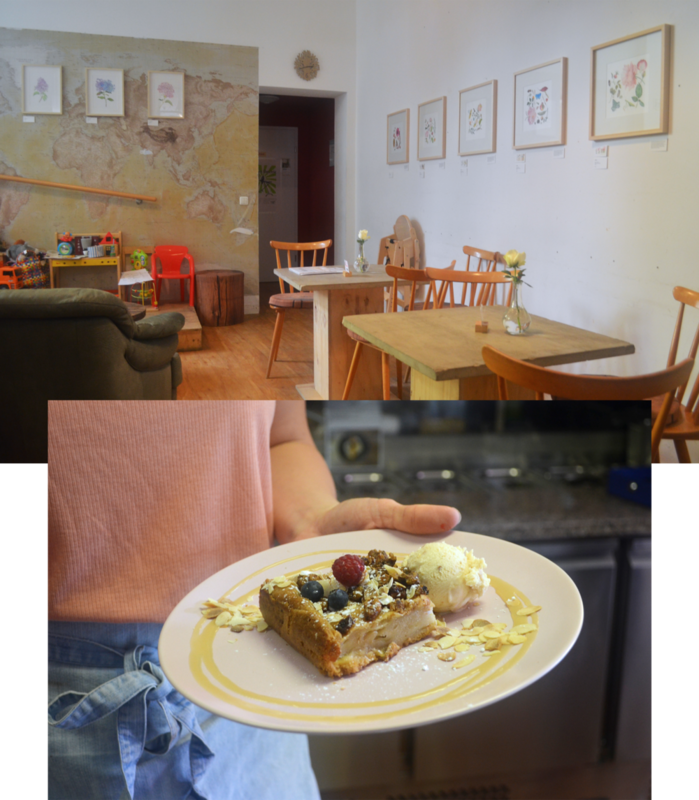 We want to keep the shop as less commercial as possible, and provide a relaxing and friendly space where people feel cozy and homey when they come here to enjoy ice cream, taking a break from the hectic world. Aside from that, we would like to extend our reach and supply Berliners with ice cream wherever they are. Whether it’s an office team event, a kid’s birthday party, or an intimate family gathering, we’re offering delivery as well as to-go cups, so there are more ways to enjoy our ice cream besides coming to the shop. What do you enjoy doing in Berlin, aside from running the shop? K: We like to spend our time in the nature, hiking in the forests or sitting by the lakes. It’s easy to do here because the forests and lakes are so accessible from Berlin. We recently discovered this spot by Plötzensee where there’s a beach area, and you’ll feel like you’re on holidays when you lie down in the sun! 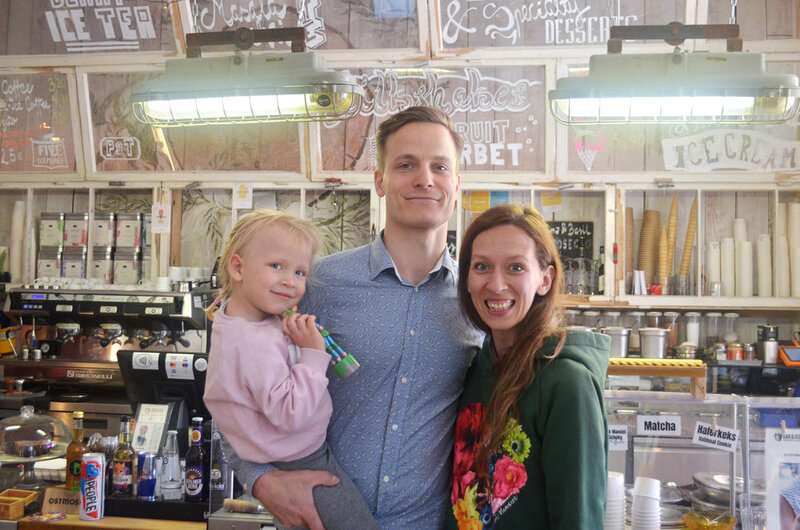 Stahu, Kinga and their lovely daughter are the ones who created the cozy universe of Oak & Ice. Do you have other passions other than bringing ice cream to people? K: Stahu is really into crafts and building furnitures. The oak in Oak & Ice is represents our relation to nature, with our ice cream being naturally based, but it’s also influenced by Stahu’s passion for handcrafted furniture design. He actually built up the interior of the shop, including the chairs, tables, countertops, and so on.